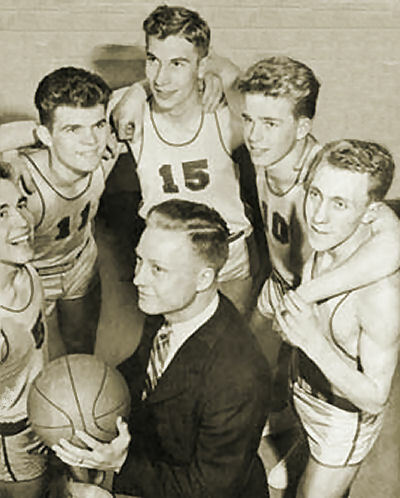 Part of 1949 Championship Team, clockwise from left: Norm Christiansen, Jay Ballif, Tom Karren, Harold Christensen, Don McIntosh, Coach Rex Olson in the center. From 1948 to 1950, Rex A. Olson was a faculty member and coach at Brigham Young High School. He taught Physiology & Eugenics, and he served as Head Coach for Football & Basketball. His 1949 basketball team won a state championship. Coach Rex A. Olson died of old age July 7, 2008 in Salt Lake City, Utah. He was 86. Rex was born in Salt Lake City, Utah to Angus Leroy and Elsie Ritchie Olson. When he was 14 years old, his father died. He grew up in poverty while his Mom worked diligently outside the home to support the family. Sports became his salvation. He often told about how he nailed a peach basket to the kitchen wall so he could play basketball at home. He was active in sports in junior high, high school, and college. Rex graduated from Granite High School in Salt Lake City where he was a star athlete in basketball, football, and baseball. He earned his Bachelor's of Science and Master's Degree from Brigham Young University. He married Barbara Hansen on February 14, 1947 (Valentine's Day) in Richfield, Utah. Their marriage was later solemnized in the LDS Temple on February 16, 1961. 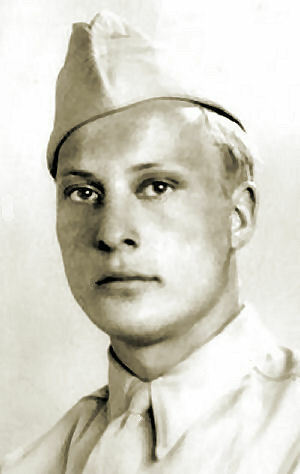 Rex served three years in the United States Army Air Corps during World War II. Rex A. Olson in the miliary. He played on the Air Corps basketball and football teams, and loved playing sports to entertain the troops. Ed Scott, now of Rancho Mirage, California, says of him: "Gentle, kind-hearted and calm, but what a fierce competitor on the athletic field. Rex and I were teammates both pre- and post-war on a State Championship softball team where he excelled as our shortstop. He was held in high regard by all who played with, against and for him!! What a great man!" After the war he returned to Brigham Young University and he received the All-Around Athlete award in Provo, Utah. He was the quarterback on the first postwar club and ranked 10th in the nation among college passers. The following year Rex led the nation in pass completions and total yardage for half of the season, and finished the year in third place. He was named to the All Conference Team in 1946. He graduated from BYU in 1948 and compiled a number of athletics records. Following graduation, Rex began work as a coach at Brigham Young High School in Provo in 1948-1949. 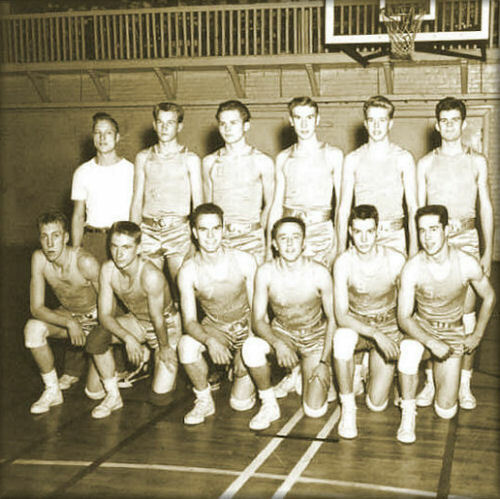 The job ahead of him was daunting; the 1947-1948 BYH basketball team had won the State Championship, and he had the big shoes of Coach David M. Crowton to fill. Kneeling, L. to R.: Don McIntosh, Kent Broadhead, Kent Lloyd, Paul Salisbury, Gene Tuttle, Norm Christiansen. Standing, L. to R.: Coach Rex A. Olson, Clifford Corless, Dallin Oaks, Tom Karren, Harold Christensen, Jay Ballif. In his first year, 1948-49, the tiny school won the Basketball Championship for Class B Schools for the second year in a row, and finished third the following year. "I played on the 1949 BY High championship basketball team with Rex as coach," says Kent Broadhead of Taylorsville, Utah. "He was an outstanding coach and an athlete of the same caliber himself." Rex returned to his alma mater Granite High School in Salt Lake City as a teacher and basketball, baseball, and football coach. He loved teaching his teams the fundamentals of sports, and did it with passion and patience. One of his players, Eldon Fortie, now of Escondido, California, who went on to become one of the first quarterback superstars at BYU, says this: "I was also one of the many who played for Coach Olson and have many fond memories of his coaching efforts. He taught me the 'correct' way to pass a football and his competitive spirit was always evident." "I graduated from Granite High in 1952," says Douglas McGregor of Salt Lake City. "Yes, Rex Olson was my coach. Our basketball team did not help Coach Olson's win-loss record, but what I learned from Coach Olson has been a win for me throughout my life." In 1978 Rex Olson retired from the educational system after 30 years of teaching and coaching. He loved all sports, and began golfing at 40 years old. He rarely missed a day of golf until he was 84 years old, and shot his age when he was 81! He taught golf for BYU and community schools for years. He was also a dedicated Utah Jazz fan. He was a High Priest in the LDS Church, serving in various capacities during his lifetime. He also was a ward clerk for 15 years. Rex was survived by his children, Karen Olson Johnson (Brian), Kathy Olson Hoggan (Lynn), and Ken Olson (Jill). He leaves six grandchildren whom he really enjoyed: Eric Johnson, Ryan (Erin) and Jason Hoggan, and Tyler (Ashlee), Trent, and McKinzie Olson. Rex is also survived by one sister, Jo Olson Schultz. He had three brothers, Floyd Olson, Gordon Olson, and Richard Olson. Richard preceded him in death. Funeral services were held July 11, 2008 in Murray, Utah. His interment, Murray City Cemetery. Thanks to the Deseret News, July 9-10, 2008. 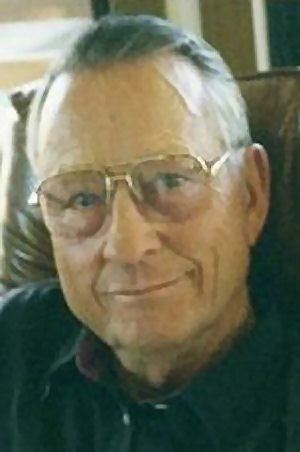 Rex A. Olson in recent years.